I love fables for making a point and I like how much easier it is to connect with the characters, to engage in the book, and to ultimately learn something from it. I’ve read some other great fables such as The Five Dysfunctions of a Team and The Goal and I really enjoyed this one as well. 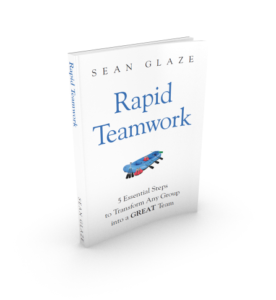 Rapid Teamwork wasn’t quite as breakthrough in the guidance and story as those examples but hits on a great topic, teamwork and does it in a setting where the teamwork isn’t all that bad in the first place, but not nearly as good as it CAN be. The story is about a manager, Greg Sharpe, who’s quickly thrown into a new challenge to take his team to an offsite rafting trip for some ‘unconventional’ lessons to learn. Sharpe’s new boss and mediocre business performance have him rather worried on on edge, but realizes through the teaching from the guide during the trip, what he and his executive team need to do to become highly productive and with stronger relationships and unity in their workplace. These steps are not just described like many self help books, but instead experienced by Sharpe and his executive team during their rafting adventure. Their guide expertly teaches them as their experience unfolds on the waters and they all seem to realize how the steps can make a real difference for them as a team. Overall, I think the book is great. Its a pretty short read, teaches valuable lessons and the adventure of rafting is one I could quickly relate to. My adventurous spirit hoped for much more excitement and descriptions of the events on the water but nothing will compare to reading the Emerald Mile for a water adventure book. Perhaps a lot of people think that these type of “offsite teambuilding” events can be a bit cliche and unsuccessful in the real world, and while I don’t disagree, I do know they depend highly on a skilled coach / guide or teacher to make them work, and this book shows an example of that, where it just works. I’ve experienced some of the same teambuilding, so I know there are many such events that do work. Anyway, if you’ve needing or wanting to understand how you can improve your own team, I’d recommend grabbing this one for your next flight or session out in your hammock (which you should have one, by the way, haha).